I like to start the school year off by doing an ocean theme. I mean, we start so early that it’s still summer – and what better time to go to the ocean than during the summer? Not to mention that the children always love doing this theme! On Monday we had a class discussion about what we know about the ocean. We talked about what we saw when we went to the beach and what animals we knew lived in the ocean. They gave me some good answers – everything from seaweed and waves to fish and people – I was proud! I told them if any of them had ever been to the beach they could bring in pictures of themselves at the ocean and even shells and rocks they might have collected. So today one of my children did just this – and everyone was very excited! 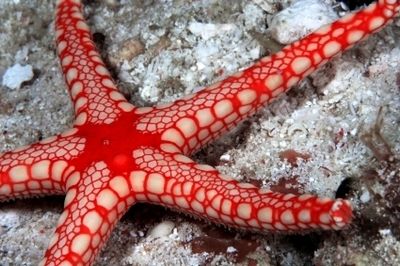 Today and tomorrow we are learning about starfish. We are also making them. I cut out a starfish shape for each child. Then I mixed plain sand with various colors of glitter – I found a muffin tin works well to keep the colors separated. I like to keep one muffin tin space open to put the glitter sand (I like that term!) with all the colors that get shaken off with each starfish. Next, each child got to put glue on their starfish and sprinkle on the color(s) of glitter sand they want! They loved this project and the starfish turned out great! We also hung our jellyfish from the ceiling so our room is looking more and more like an ocean each day! The children were awestruck when they walked in to discover them hanging!